Drew Lutz scored 21 points and Kegan Hoskins added 19, but the Kingsmen lost to Fort Wayne Carroll, 80-63, on Saturday, Jan. 13. Lutz also had six assists, and Hoskins pulled down eight rebounds. Noah Applegate scored nine points, and Beau Ludwick scored eight points. PENN 63: Carter Hickey 0, Drew Lutz 21, Drew Schneider 6, Beau Ludwick 8, Luke Carlton 0, Noah Applegate 9, Noah Krathwohl 0, Kegan Hoskins 19. Carroll 80: Blake Pocock 3, Daniel McKeeman 16, Reece Swoverland 20, Arius Jones 4, Nathan Fish 8, Richie Gross 2, Preston Shearer 5, David Ejah 14, Riley Perlich 8. 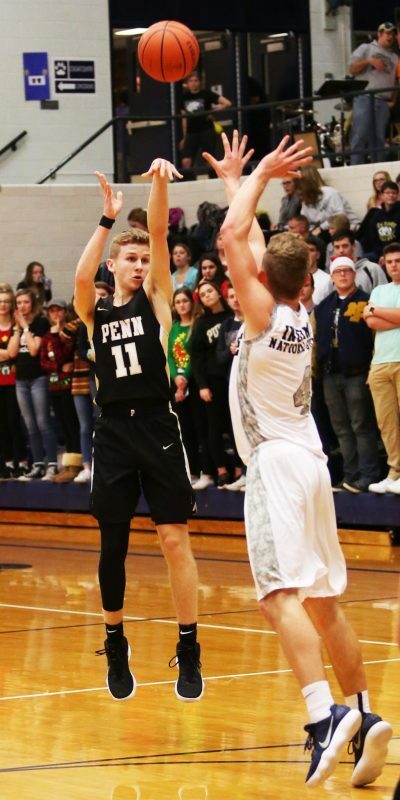 Three-pointers: PENN 6 (Drew Lutz 2, Drew Schneider 2, Noah Applegate 1, Beau Ludwick 1); Carroll 9 (McKeeman 3, Swoverland 2, Fish 2, Ejah 2).